At yesterday’s D23 Expo, Marvel’s star-studded panel shed some new light on Avengers: Infinity War. See images from the panel + concept art. Yesterday’s D23 Expo Live-Action presentation was chockfull of goodies, including new footage from A Wrinkle in Time and Star Wars: The Last Jedi! But there’s no way Walt Disney Studios could have a panel without an appearance from the Marvel Cinematic Universe. Kevin Feige, President of Marvel Studios, was on hand to give fans an update on the highly anticipated Avengers: Infinity War. Ever since we got a first look when production began back in February, I know many of us have been wringing our hands about the discord among our fave superheroes and the ways in which Thanos could take advantage. According to Feige, Infinity War is the culmination of Marvel Studio’s last ten years. Almost ever hero they’ve introduced will be in this film, all coming together to take on the biggest, baddest villain yet. 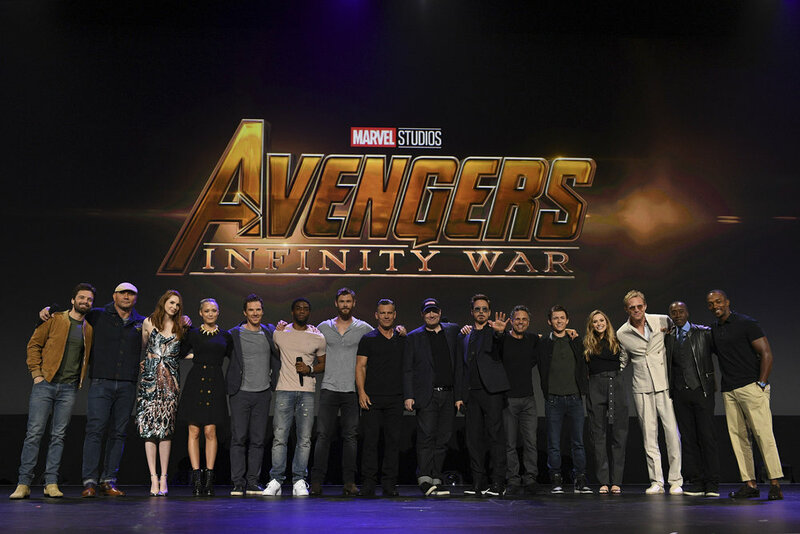 Feige then introduces Josh Brolin (Thanos), Paul Bettany (Vision), Elizabeth Olsen (Scarlet Witch), Pom Klementieff (Mantis), Karen Gillan (Nebula), Dave Bautista (Drax), Don Cheadle (War Machine), Sebastian Stan (Winter Sodier), Anthony Mackie (Falcon), Benedict Cumberbatch (Doctor Strange), Tom Holland (Spider-Man), Chadwick Boseman (Black Panther), Mark Ruffalo (Hulk), Chris Hemsworth (Thor), Robert Downey Jr. (Iron Man), and one-half of the directorial team, Joe Russo. O.M.G. The cast and creators reflected on Marvel Studios’ last 10 years, and revealed a new logo to mark the anniversary. The audience was also treated to an Infinity War trailer, and while it hasn’t been released, thanks to The Hollywood Reporter, there are some highlights to share. Go HERE to read their description/analysis, but the things that stand out most to me are: (1) Captain America has a beard 😉 . (2) The fact that allllllll of these superheroes across time and space have assembled together and Thanos still seems to completely demolish them. This is SCARY. With San Diego Comic-Con this week (*FLAILS*) and the Marvel panel on Saturday evening, you have to wonder what additional sneak peeks we’ll get. It’s possible that since D23 Expo focussed on Infinity War, SDCC will hone in on Thor: Ragnarok and Black Panther. In any event, we can’t wait! Take a look at 35 images below of yesterday’s star-studded Marvel panel. 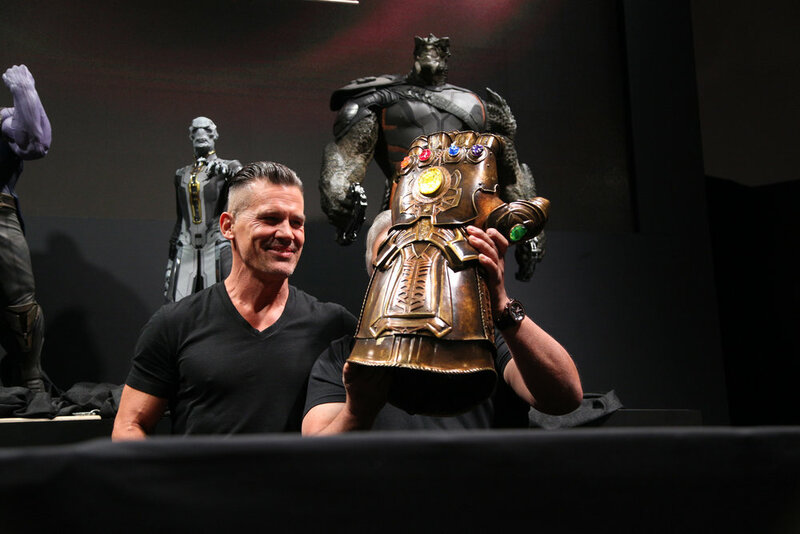 The photos also include Josh Brolin’s autograph signing at the Marvel Booth, where they revealed the concept art for Thanos, the Children of Thanos/Black Order (IGN has a great summary of this supervillan squad), and the Infinity Gauntlet. There’s also a video of Feige introducing the cast and some of their fun interactions (below, via JoBlo Movie Trailers).